What is a “DIE” package? In a list of ICs, along with the familiar package names such as QFN32, LQFP48, etc., I've seen a few ICs to be listed as DIE for the package size. I've never seen that description before as an IC package size, and Wikipedia does not list it either. I assume it's some kind of chip-scale package, but it does not reveal the silicon size or any other properties, like number of pins, etc. It refers to a "raw die" -- meaning the chip is not packaged. You will get a piece of exposed silicon (possibly encapsulated or partially so, but typically not). 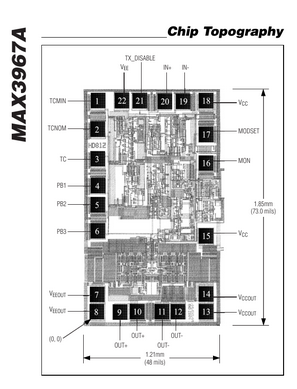 Consider the Max3967A from Maxim Semiconductor. If you want to buy the conventional packaged version the part number is MAX3967AETG+, but if you just want the raw microchip inside (no package) you want part number MAX3967AE/D. In the catalog the "package" for the "/D" version will be "DIE" -- meaning no package. You can see they dimension the die in the drawing for you. You will need access to a wire bonding machine in order to use a raw die (among other things). 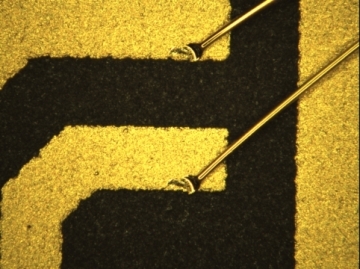 In this microscope image, you can see two wires bonded (attached) to the package in the center. 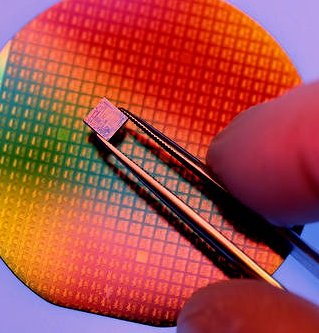 it is mostly only useful for other IC manufacturers if they want to integrate it into their ICs. So you are right, it's not what I want. 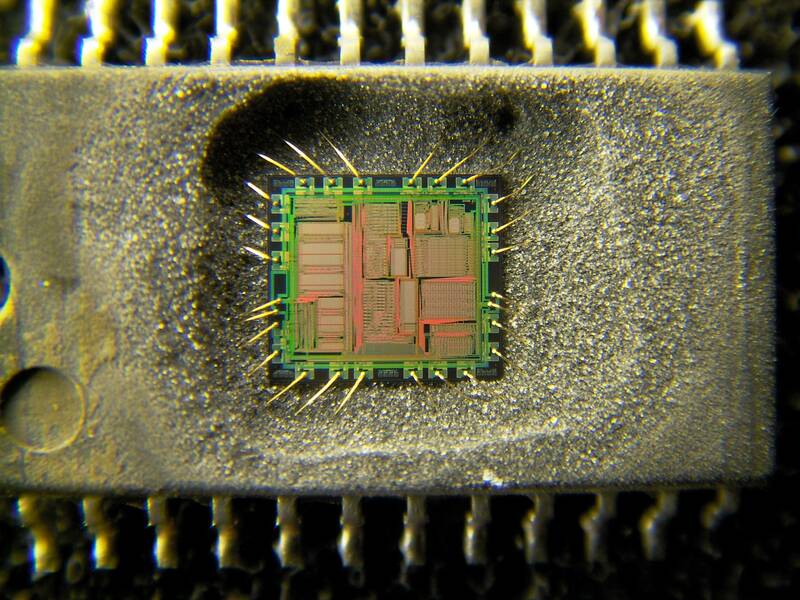 MCM -- What you described in your comment is called a Multi-Chip Module (MCM) and, yes, you are correct. Low Cost -- It is also common in really cheap electronic devices to skip the cost of packaging. They use unpackaged dies and glue them to the substrate (PCB), bond the pads to the board directly, and then encapsulate the die in an epoxy to secure, seal, and protect everything. High Reliability -- It can also be done this way for speciality applications where the absence of a package (and the manufacturing and soldering points of failure that come with it) are advantageous for reliability. 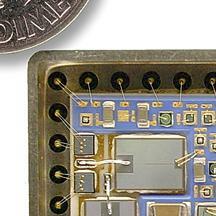 A DIE is the actual silicon chip (IC) that would normally be inside a package/chip. 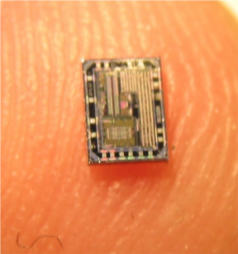 Their just a piece of the wafer disk, but instead of being mounted and connected in a 'chip', and covered with epoxy. You can just buy the wafer piece on it's own. This save a lot of money, but they are much harder to work with. Other than the cost, they also save a lot of space, since you don't have actual pins, etc. You have probably seen a circuit board for a cheap led screen and it has little black bulge... This is the kind of thing a 'DIE' package is used for. This is referred to as "Chip on Board" as shown below. 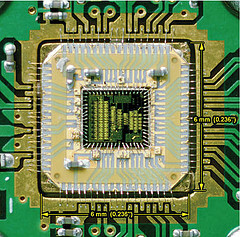 The left image shows the die directly mounted on the PCB, with the bond wires connected to the copper traces. The right image shows the protective epoxy coating applied after the connections have been made. You can see a lot more images of dies in a package on my answer to How thick (or thin) is the die/wafer inside an IC. Not the answer you're looking for? Browse other questions tagged integrated-circuit or ask your own question. What does the “Dice” package look like? How thick (or thin) is the die/wafer inside an IC? Package on package and Flip chip what is the difference? 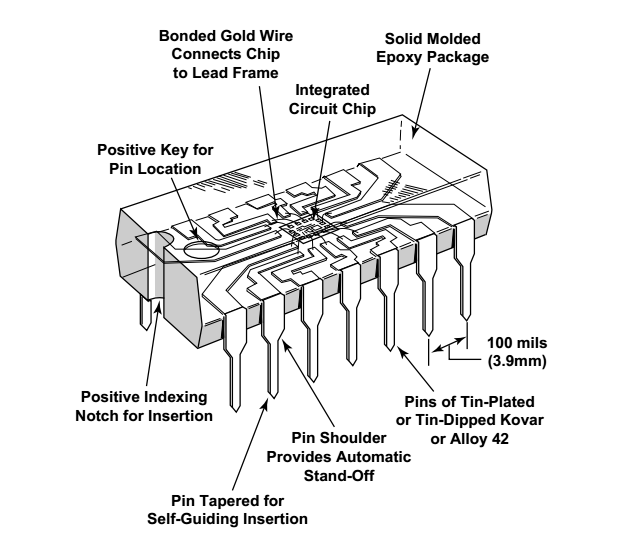 How does soldering affect the internal bonding between the IC die and its package? What is the type (or package) of this IC? The purpose of getting IC temperature or the die temperature?